Over the years I had a couple of pretty lame business cards. You know the kind that your employer issues to you or the ones you print out yourself after an hour of fiddling around with a graphics software. During the last years I did not have a business card. While I am not great at handing out my business card, I do get occasionally asked if I have one, and then I am embarrassed that I don't have one. The most recent such incidence prompted me to get a business card made. But I did not want to get one of those lame ones. What follows is the business card strategy I developed for myself. Maybe it helps you in your own quest for your ideal business card. Marketing effect. If you sell something, be it products or services, then handing out a business card will have a marketing effect based on for how long your card is retained or if it is passed on to somebody else. If your card is thrown in the trash just a few hours after you handed it out it will not provide much marketing impact. The more often your card is being looked at the higher the marketing effect will be. Memorable event. If you can incorporate the card in some memorable event, say a magic trick or puzzle, then the actions of that event can make your card special to the person you are giving it. It is therefore less likely being tossed into the next trash can, because it serves as a memorabilia. Beauty. Particularly beautiful cards or clever designs or unusual material (metal, wood, fabric, ...) tend to be retained simply because they are unusual and fascinating or stimulating to look at. Useful card. If you can make the card useful beyond the contact information on it, then the likelihood of card retention is increased, because people would keep it for its usefulness. Since I am not a for-hire magician or entertainer the first option, the 'memorable event', does not apply, at least it is not something I plan on doing regularly. For a professional performer or speaker this would be a very effective way to hand out business cards. Depending on how this is done it could dictate certain design aspects. For example, magicians sometimes hand out business cards with a printing effect where the card is first shown blank and then it magically turns into a printed card. For some methods the backside of the card has to be blank. Others print something on the back with which a little magic trick can be performed. The 'beauty' strategy is tough. I searched online for unique and creative business card designs. I found a lot, but I didn't want to copy anybodies design, nor did anything inspire a new creative idea in me. Also a creative design has to fit your business or personality in some way, which makes this twice as hard. I felt that the 'useful card' strategy was the most viable strategy for myself. I also think that this would maximize the marketing effect, because if a card is truly useful then every time it is used it would have a marketing or branding effect, potentially other people would see it, too, and multiply the marketing effect. One of the easiest and most effective ways to make your business card useful is to take a credit-card-sized USB flash memory and print your logo and contact information on it. USB flash memories are in widespread use today and very welcome little gifts. Even if the person whom you give the USB flash memory has already other flash memories it is unlikely that it would be thrown in the trash. Most likely it would be passed on to somebody who does not have one. The biggest downside is their price. But since I rarely hand out a business card this did not bother me that much. For those who like to toss out a few hundred cards a week the USB route will not be an economical strategy. Daylight Saving Time: I never know when it starts and when it ends. I also get badly confused between Europe and the US which start and stop on different dates. Phonetic Alphabet: When I am on the phone having to spell my name or address the phonetic alphabet is perfect. Unfortunately I tend to forget parts of it. For my private helicopter license I had to learn the phonetic alphabet. You know the 'Alpha, Bravo, Charli, Delta, ...' but the problem is if you do not use it regularly you forget parts of it. Unit Conversion: Having grown up in Europe I have no feeling for the units used in the US. I have to convert them to metric units to get a better handle and understand how much it really is. How many liters are there in a gallon? How many meters in a mile? How many grams in an ounce? Also the whole Farenheit business is quite troubling and needs to be converted to Celsius to make sense to me. While all this information can be looked up online it takes time even if you are in front of a computer. Pulling out a card from my wallet would be much easier. Below you can see my ultimate design. Maybe it is overkill, but I like it. 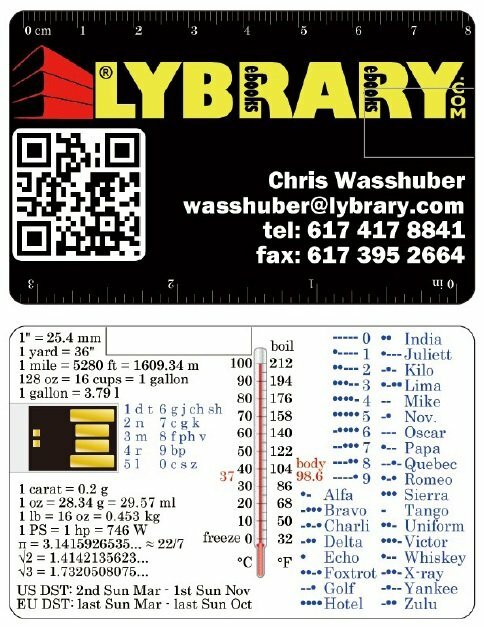 QR code to go directly to Lybrary.com. Looks geeky and serves a marketing purpose. Centimeter and inch rulers on the front long edges. What I really hope will happen is that somebody gets stranded somewhere with my business card, and due to the morse code printed on it, is able to signal to rescuers, is rescued, and it makes the news :-) That would be the ultimate in usefulness and marketing effect. The certainly may be the most feature-rich business card ever!! The company that manufactured these cards is Flashbay (www.flashbay.com). They have dealt with my mini order very professionally. I can recommend them.